This is the map of Beleriand and lands to the north, as described in the Silmarillion of J.R.R.Tolkien. Review by Den-Sel on 2/6/2019. Nice to see a different Tolkien universe map than the usual LoR one. I do note that superbonuses are a bit unbalanced (Gondolin - 3 for 23 territories (0.13), Falas 4/17 (0.24) Hithlund - 12/37 (0.32), etc). Also, when someone is setting up scenarios, he/she should probably increase the Angband bonuses considerably to make it faithful to the story. All in all, great map. I will probably set up a few levels after I've played it a few more times. I used different ratios for bonuses consciously. I set the "Realm of Gondolin" bonus only to 3 because it almost completely coincides with the "Vale of Tumladen" superbonus (the city of Gondolin) that is worth 4 armies. If you count both superbonuses, the ratio is 7/23 (0.3). And I deliberately lowered the bonus values for Falas, because it turned out to be overpowered. If it is united, it is very easy to defend it. And it is relatively easy to unite Falas, since it is one of the smallest superbonuses. Review by Koen27 on 2/10/2019. Review by Riskiskool on 3/14/2019. Very nice map, and great aesthetics, but I think the Ered Gorgoroth region is a little too large, and I do wish that the green elves of Ossiriand were included. 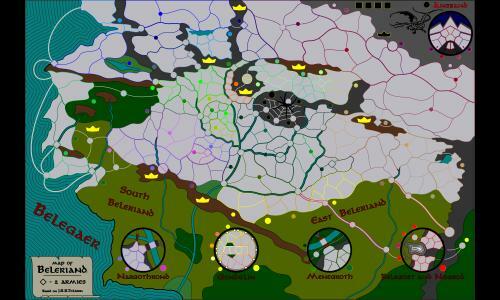 Other than that, great map, and fun for recreating the wars of the First Age. Review by musashi on 3/16/2019.